I am not someone who believes in commercial ‘detoxes’ or ‘cleanses’. I think the idea that we need to ‘cleanse’ our body underestimates the incredible capacity it has to regulate and detoxify itself. There is no need to part with lots of your hard-earned cash to cleanse your body. That being said, there are certain foods that can support your liver as it carries out its job of detoxification. 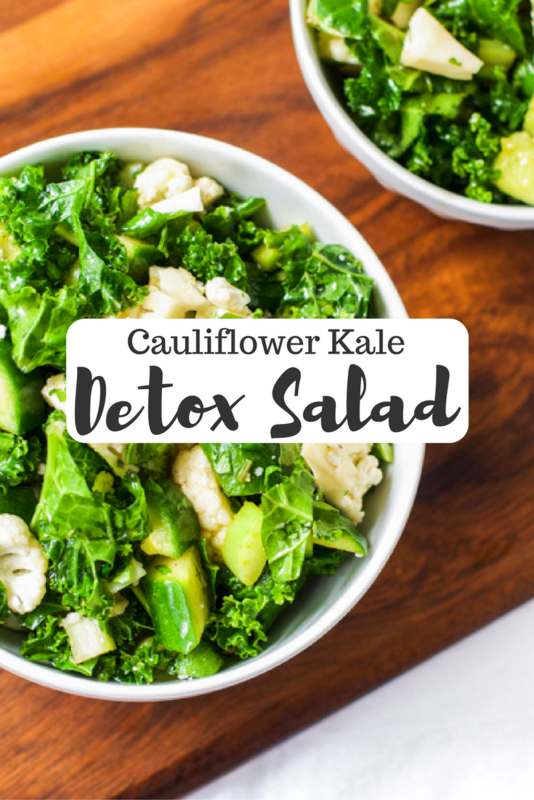 This cauliflower kale detox salad contains lots of ingredients that have been shown to have a positive impact on the body’s detoxification process. So if you feel the need to help your body detox, why not whip up a batch? 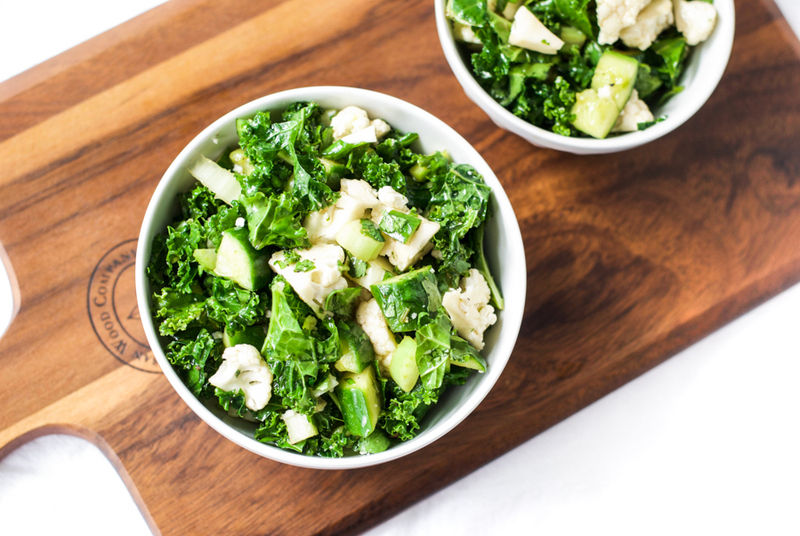 This cauliflower kale detox salad has a light, fresh flavor, making it the perfect accompaniment to any meal. A one-cup serving contains just 62 calories with almost 80% of your daily vitamin C requirement, 3 grams of fiber, and 2 grams of protein. 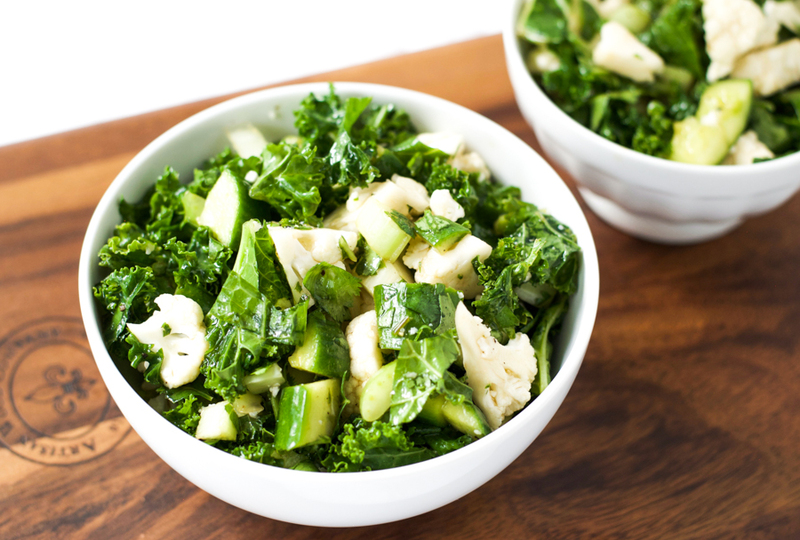 All of the ingredients have been shown to help the liver carry out its detoxification function, making it an excellent salad to include in your regular diet. It was even approved by my 6 year old, who enjoyed tasting all the different diced-up ingredients. A plate that makes us healthy and happy! Great concept. Very well said, I also don’t believe in commercial ‘detoxes’ and fab ‘cleanses’, however there are definitely some foods that always make me feel good and that make me feel instantly healthy (aka detox :D). 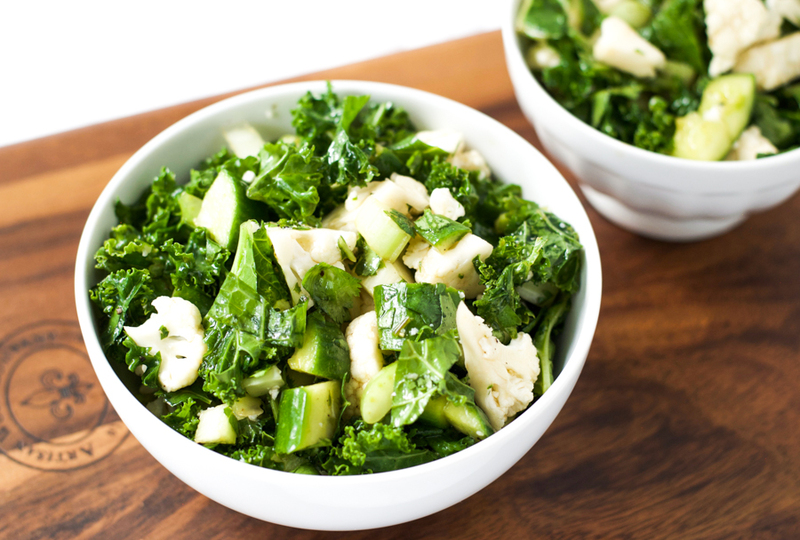 I love salads but sometimes I make the same ones over and over again, so it is wonderful to see your delectable cauliflower kale detox salad. I love the fact that these ingredients have been shown to help the liver carry out its detoxification function I look forward to making this. I’m pinning and sharing as well. Thank you for your comment Deborah. I know what you mean about salad groundhog day. I hope you like the salad. This salad sounds absolutely delicious! Such a great way to get veggies in during the winter months. Thanks so much for sharing on the Healthy Living Link Party! We will be featuring your recipe tonight 🙂 Have a great evening! Hi Esther! I was told the other day that you shouldn’t eat raw kale because of certain properties, but I had never heard that before. I actually love kale, so I was curious to know your thoughts on it. Thanks! Hi Josie. Thank you for your comment. I think you might be referring to the fact that kale is a ‘goitrogenic’ food. Goitrogens can block the uptake of iodine by the thyroid. Quite a number of vegetables contain goitrogens, including kale, cabbage, cauliflower, broccoli, rutabaga, turnips, Brussels sprouts, and mustard greens. Cooking or heating inactivates the goitrogens. It is based on this information that people make claims about raw kale being bad for you. But in reality, it is highly unlikely that eating raw kale would cause a problem unless you were eating it by the bucket load, or you had a coexisting iodine deficiency. In the absence of those two scenarios, you are highly unlikely to experience any problems from eating raw kale. Great question though. And if you have any more questions please feel free to ask. Thank you for your response! I will continue eating my kale, haha.